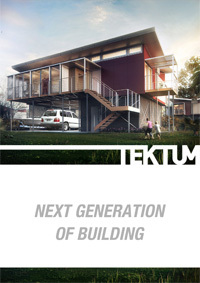 TEKTUM is a company committed to innovation – particularly in the ready-made housing market. 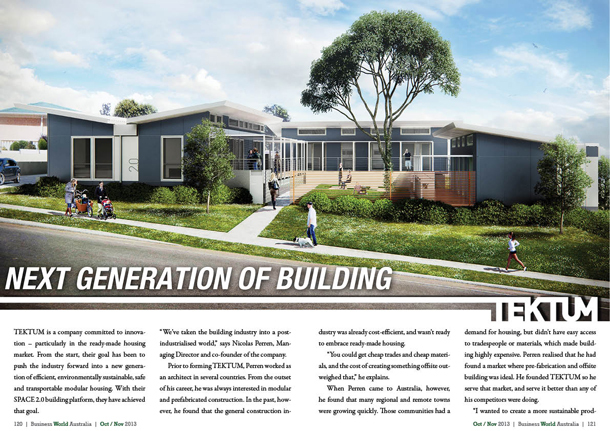 From the start, their goal has been to push the industry forward into a new generation of efficient, environmentally sustainable, safe and transportable modular housing. With their SPACE 2.0 building platform, they have achieved that goal. 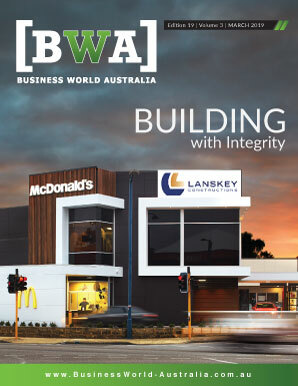 “We’ve taken the building industry into a post-industrialised world,” says Nicolas Perren, Managing Director and co-founder of the company. Prior to forming TEKTUM, Perren worked as an architect in several countries. From the outset of his career, he was always interested in modular and prefabricated construction. In the past, however, he found that the general construction industry was already cost-efficient, and wasn’t ready to embrace ready-made housing. “You could get cheap trades and cheap materials, and the cost of creating something offsite outweighed that,” he explains. When Perren came to Australia, however, he found that many regional and remote towns were growing quickly. Those communities had a demand for housing, but didn’t have easy access to tradespeople or materials, which made building highly expensive. Perren realised that he had found a market where pre-fabrication and offsite building was ideal. He founded TEKTUM so he serve that market, and serve it better than any of his competitors were doing. With those goals in mind, TEKTUM created a prototype building model. In the years since, they have continuously refined the quality and efficiency of that model. Along the way, they have been earning the trust of individual clients and government bodies, and raising their profile in the market. According to Perren, SPACE 2.0 is “the next generation of cost-effective, ready-made buildings.” With it, he says they have transformed the pre-industrial construction industry into a high-tech one, and ensured buildings can be produced and operated at a higher quality for a lower cost. Perren describes SPACE 2.0 buildings as “environmentally sustainable and safe,” and says they look and feel like their traditionally-built counterparts. They can be quickly installed anywhere in Australia, and are particularly valuable in areas with skilled labour shortages. The product can be transported by road, rail or ship, and can be on site within a few weeks of order – and then ready to occupy within a couple of days from arrival. And though SPACE 2.0 is efficient, that does not mean it compromises on quality. All models are constructed with high performance insulation, double gazed thermally-improved windows, large roof eaves, rain water recycling, and compact florescent lighting as standard inclusions. They are also constructed using safe materials, non-slip tiles, and electrical safety switches. Even more, the paints, glues and materials are all of the highest standards, and toxic materials like formaldehydes are practically eliminated. According to Perren, TEKTUM can achieve their high level of quality because their product is built under controlled factory conditions, with safe and efficient mass-manufacturing techniques. Also, because SPACE 2.0 homes are manufactured off site in large volumes, they represent huge savings when compared of the cost of traditional construction. TEKTUM’s manufacturing processes are computer-integrated, and thus scalable and flexible. Their system can generate a range of models, everything from studios to four bedroom houses. They can also produce hotel room type accommodations, as well as commercial spaces like offices, cafes, shops, or medical treatment rooms. TEKTUM’s next generation technology has received a lot of attention from the industry and media. Their innovations have been the subject of many architectural and building conferences all around Australia, as well as more than a few newspaper articles. Recently, the company kept that momentum going by receiving a prestigious engineering accolade. At the 2013 Australian Engineering Excellence Awards, TEKTUM was a winner in the Products, Manufacturing Facilities & Processes category. That award recognises excellence in any aspect of manufacturing where Australian engineering work has made a vital contribution. The category covers all industry sectors, as well as all scales of operation – so the competition is fierce. TEKTUM won the award for their SPACE 2.0 – BUCASIA BEACH HOUSE. In their comments, the judges praised the SPACE 2.0 platform, and cited its many advantages. They said it “sets new benchmarks for factory-made houses through its innovative design,” and specifically commended the way it made both transportation and assembly easy.